The Pebble Smartwatch will now support popular golf GPS rangefinder, Freecaddie, as version 3.0 of the Android app features Pebble connectivity. The app uses the GPS on your phone to calculate the distance between you and the hole on over 28,600 courses around the world. Stats can then be brought up on the Pebble display. The support is only available on Android from the Google Play store but Pebble have announced on their Kickstarter project that iOS Freecaddie support is on the way. The Pebble Smartwatch began shipping back in January and a new update of the SDK is on the way which, "will enable apps to receive and transmit arbitrary data back and forth to the phone (for example, upon a button press on the watch)". Developers will need to write an Android or iOS app as well as a native Pebble SDK app. Android apps can be published to Play Store but the limited 2-way communication will not allow iOS apps to be published to the app store "at this time". Good news for iOS users, watchapps is now available from the latest version of the App Store (1.0.6), allowing download of various sources of pbw files. 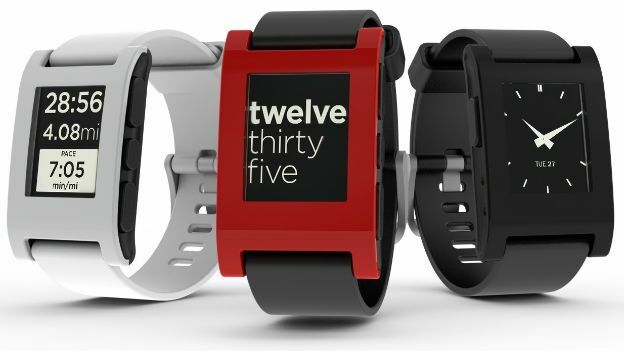 Pebble have also announced that shipping on Red Pebbles has started. Orange will be next, followed by Grey and White. Customers can switch from colour to black at anytime.